Holasandur (The Sand of Hills) is a desert between Husavik and Lake Myvatn. It is 130 square km area of black sand. Here the destroying forces of nature and humans have been playing around for almost 300 years. The result of that interplay is this desert surrounded by a relatively good soil and well grown land. This desert is man-made at only 270 to 400 meters above sea level. Here you can see one of the biggest land care project in Europe. 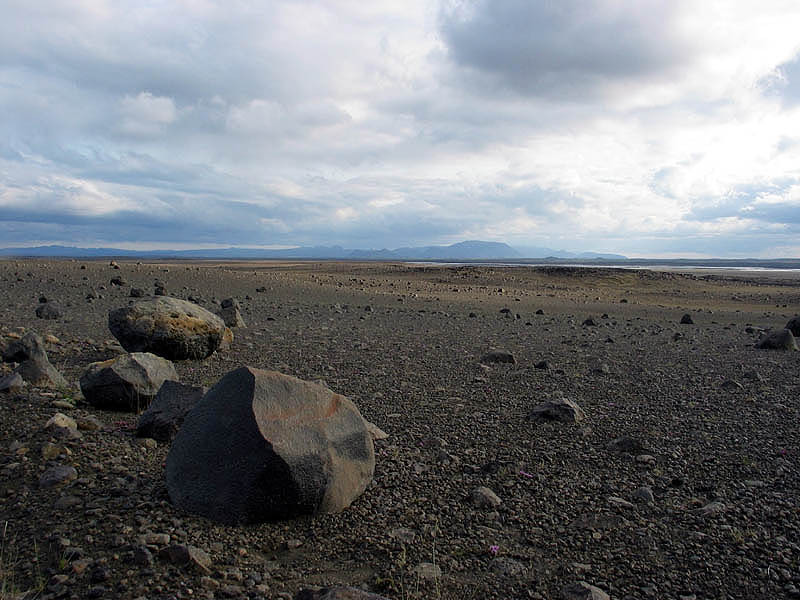 If the project works, it can be used to get rid of man-made deserts in Iceland. Iceland has lost over 80% of its valuable soil after the settlement. This vegetative improvement project is a new approach to restore the quality of land in our country. The area was a well grown highland with birch bushes and wild salix. Remains of coal production has been discovered in the sand, which tells us that even trees were growing in the area. To be able to stop the degradation, it is necessary to cover the area with some kind of vegetation. Alaska lupine is used for that purpose. The lupine produces fertilizer and is a supplier of fertilizer to other plants. The lupine prepares the soil for higher level of flora. Birch, salix and other types of higher plants are being planted in islands on the sand. These green islands will supply the land with seeds in the future. In a project of this magnitude and with the limited financial resources available, it is not possible to use grass and fertilizers, which is the classical method in land conservation. It will cost ten (10) times more. IT will cost "one thousand million" Icelandic kronur, instead of "one hundred million" Icelandic krónur, to use grass and fertilizers, rather than to use the inherent fertilizing effect of the lupine. The lupine will become self sustainable in the desert and prepare the soil for other plants. In the year 1992 a few people interested in land care came together and decided to regain the prosperous earth that is lost. In association with the State Soil Conservation Service, "Landgraedsla ríkisins", a ten years plan was designed with the purpose to recover the soil on Holasandur. The total cost was estimated around 100-120 million Icelandic krónur. It was reasoned that the only practical method was to plant seed of lupines in the sand by special machines. The land care group ("HUSGULL") collected money for these special machines that are used for planting the lupine in the sand. Already at that time, many individuals, shop owners and big companies wanted to join forces with our little green army. The plastic bag you buy in the store for your goods is the financial background for the project. The association of shop owners in Iceland decided that the income from selling these bags should go to environmental projects. The Holasandur project has been rewarded 4-5 million Icelandic krónur per year during the last ten years from this clever plastic bag fund. What you will see at Holasandur, is the first step to overcome a desert. The critical step is to recover the soil, and the lupine takes care of that. Secondly we are planting trees in certain spots in the lupine fields and these islands of trees, are supposed to act as a seed reservoir in the future. It has been estimated that it will take at least 200 years to repair the damages here. It is worth to notice that this project was subjected to heavy environmental regulations. It is called: “Evaluation of the possible harmful effect by the activity on the environment”. The project was thus placed in category with nuclear plants and major building plans and this was forced by fanatics in the environmental society, who claimed that the black sand was worth protecting and that soil, plants and trees were a challenge to the black sand,. Black sand is truly not endangered species here in Iceland. Some people might say: "But the desert is so nice to watch!!!" Most people would answer: "Maybe through the windows of the bus, but there is no shortage of deserts in the Icelandic highlands. Deserts are terrible to live with". We know that you think it is bizarre, to see all these sheeps running around freely and feeding themselves on the last remains of Birch. At the same time the nation is spending a lot of energy and a lot of money planting trees in fences and to build fences around a relatively small part of the Birch remains in some places, to fight land erosion, which is mainly the result of overgrazing. We can neither control the weather, nor the volcanoes but we could control the grazing. We must realize that we are all part of nature, not just the scientists. It is best for our environment that people learn to appreciate nature by actively enjoying it. To show care and responsibility is what matters, not regulations and restrictions. Overprotection and the misunderstanding that nature is untouchable, is hindering people in living with nature and stopping people from taking action . The project is open to everyone to take part. If we do not care , who does?